When considering what the future of Stillwater Area High School might be, a group of staff and community leaders took a two hour drive up north. More than 40 district and community leaders and teachers have traveled to Alexandria, MN this spring to learn more about Alexandria Area High School's unique programming. The school works closely with its local businesses to give students relevant learning experiences - both in the classroom and in offices, labs and factories in the surrounding community. Business leaders also work with teachers to develop curriculum, serve as mentors, offer internships, and create on-the-job learning experiences. Learn more. We've extended the deadline - Monday is the last day to share your ideas about the future of our schools. You should have received an email invite to Thoughtexchange. Didn't get it? Register online. We want to hear your thoughts and ideas about the skills and attributes our students need to succeed. Monday is the deadline for Step 1 - sharing your ideas. But you can still take part in steps 2 and 3 throughout the rest of May, which will allow you to read and consider other people’s ideas, and help establish priorities for district leaders to consider in planning for the future. Learn more. Testing season is nearly over as students across the district are wrapping up Minnesota Comprehensive Assessments, Advanced Placement exams, and much more. Thanks to an investment in technology and infrastructure by the school board, testing went better than ever this year. Students had more, reliable access to Chromebooks, which reduced the amount of time wasted with down computers. The testing schedules were also designed to be more student-friendly, with more time between tests and shorter test-taking sessions. Oak Park Community Open House on Saturday, May 20 from 10 a.m. to 1 p.m. Celebrate the history of the school, browse through memorabilia and photos, and share your own video memories. Learn more. Withrow School Celebration on Wednesday, May 24 from 3:30 to 5:30 p.m. Join with the Withrow community in a walk through the school. A community dinner will also take place at Sal's in Withrow beginning at 5 p.m. Learn more. Goodbye Gathering of Marine Elementary School on Friday, May 26 from 3:15 p.m. to 5:30 p.m. View a slideshow of our favorite moments, browse through memorabilia and take a ceremonial last walk down the hallway. Learn more. Students at Stillwater Area High School have a second chance to eat breakfast. After first hour each day, students can now grab a quick meal during passing time. Options include things like yogurt parfaits, fresh fruit, apples with peanut butter, banana bread, juice and milk. Read more about the pilot program. 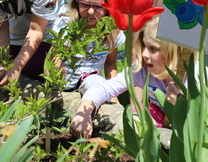 Oak Park and Lily Lake fourth-graders came together to forge new friendships, and celebrate the end of a unique gardening project (funded by the Partnership Plan). The students worked with Washington County Master Gardeners to grow their own vegetables, many of which will be transplanted into Lily Lake's School Garden to be harvested next fall. This was an opportunity to connect the schools, as many students will move to Lily Lake next fall. Read more. 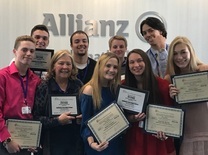 Students from the SAHS marketing class earned four of the top five places in the Minnesota BestPrep Stock Market Game. Stillwater teams placed first, third, fourth and fifth in the investment competition. Some 400 teams from across the state competed this spring. Read more. See the latest news on Facebook.